Just when that day is coming, who can say, who can say? " While only a little on the small side in terms of height, Tana’s build is downright frail-looking. She's skinny and definitely not muscular, the sort of person who looks like they could get beat up by an eight-year-old no matter what height advantages might exist. She has a narrow face, with a small nose and generally soft features. Her skin is pale, due to her habitual avoidance of bright sunlight, and her eyes are green and large. Her hair is thick, a muddy brown color that's unremarkable, but it's long; generally she keeps it in a braid that's often thrown over one shoulder. She doesn't seem to have much fashion sense, thinking that clothes too large actually fit her, and she wears a ridiculously large, floppy sunhat when she goes outdoors. She's not much good with color schemes either, and has been known to either dress drably or in colors that clash horribly; one might even be forgiven for believing her to be colorblind, though this is not the case. Tana was always the quiet one in her family. She's more than a little bookish, often preferring the company of the written word to other people, and as a Trader she often had access to all sorts of documents. She's soft-spoken; the only time her voice is ever particularly loud is when she sings. She, like many other sopranos, struggles mightily with volume control. She's not especially outgoing, making few friends and preferring to be exceptionally close with a small number of people, since large gatherings can tend to stress her out. Tana definitely lacks confidence, both in herself and in others’ perceptions of her. She finds both to be rather lacking. Despite not particularly liking the spotlight, she longs to feel successful, but more importantly she longs for others to believe she's successful. Her reputation is of the utmost importance to her. She's utterly terrified of failure, but especially of being perceived by others to be a failure, to the point that she doesn't like to try new things for fear that she won't be good at them. If it comes down to disappointing only herself or failing at something where others will see, she'll choose the former every time. This makes her a good worker, studious and careful in her pursuit of perfection, but that doesn't mean she particularly likes helping others. In general, unless she genuinely cares for a person, if nobody would ever know that she hadn't done anything to help a person, she'd pass right on by. She's bright, and a fairly good musician considering how short a time she's been training. Her knowledge retention is commendable, and while she doesn’t generally actively pursue new information save for what happens to be in front of her in written form, if she discovers there’s a secret she decides she needs to know it, and will do what it takes to find out. However, Tana is not an especially good Harper. She's hesitant to put herself out there, getting nervous even in front of her teachers. She's trying to learn to deal with her stage fright, but it's not something she'll ever really get over. A less stubborn person would probably admit that she'd be better off as a scribe, but Tana refuses to quit trying lest anyone know she'd failed. The same goes for Candidacy: she just hopes she doesn't age out. She has a massive crush on Tuckal, who she sees as the pinnacle of beauty, success, and likeability, despite the fact that they've never once even spoken to each other. Tana was the third child, and first daughter, born to a pair of Traders. For most of her life, she’s never known what it was to settle down in a single place for more than a few days. Always it was traveling, bringing both necessities and luxuries from Weyr to Hold to Weyr again, though for at least her early life they didn’t do much business with Weyrs, sticking to Holds. It wasn’t that she particularly cared for the life; Tana hated having to deal with new people all the time, and was never any good at haggling. For the most part, once she’d learned to read and write, she helped keep track of inventory and orders. However, if there was anything that made her never want to leave the Trader’s life, it was the books. Books, and scrolls, and records, and documents: if it was written and unsealed, Tana would get her hands on it and read it while they traveled to its final destination. That alone made any other difficulties she faced worth it. Sure, a Weyr might have a lot of records, but what if she read them all? What would she do then? As a Trader, she’d never run out of new material! Therefore, when her older brothers both left the caravan to find lives of their own, Tana stayed. She did it for the books. And, she’d admit, she rather liked her family. They at least were worth her time. It wasn’t until her parents decided to stay a while at Fort Weyr to have their ninth child that she began to consider seriously settling down. The archives there were even more extensive than she’d ever imagined! But it wasn’t the archives that eventually captured her: it was a Harper. Well, and the archives, since that was where she found her. The Harper had been doing research, and that was how Tana learned that Harpers got to do quite a bit of reading themselves. So she planned for a life of her own: she finagled her way into an apprenticeship. She was old, much older than most apprentices, but luckily the Weyr’s Harpers were more accustomed to taking students later in life, and so she began to learn. She quickly found that music wasn’t especially difficult--notation was just another form of reading, really--though instruments could sometimes be difficult. She was considerably more comfortable with the bowed instruments than others, though learning the drumbeats felt like a secret code. It was performance that she would always struggle with: even in front of her teachers, she would freeze up. Her throat would tighten and the notes would come out sour, her hands would shake and bowing would become near impossible. It was Otter who talked her into another alternative: Candidacy. Out of fear that she might never be anything as a Harper, Tana latched onto the idea. Becoming a rider and ceasing her Harper studies wouldn’t be failure at all! So she stood alongside her sister, only Otter Impressed. To a… what in Faranth’s name was a ‘carnelian’ dragon anyway? And why was she so hyper? Though, Tana had to admit, that wasn’t particularly unlike her sister. Still, she was rejected, and found herself rather discouraged as she resolved herself to continuing her Harper training. What if she aged out? It was several Turns away still, but what if she did? But it was at the Hatching Feast that she saw her: Tuckal, the Weyrwoman. Beautiful, collected, confident… everything that Tana wished she could be. People liked her, people thought her opinion mattered. And Tana found herself very much wanting to attract her good opinion for herself, and thus started a crush that has so far not begun to show any signs of abating. Continued her crush on Tuckal, and attempted to send her a love letter. It was not well-received, and assumed to be a joke. Left the Touching early because none of the eggs liked her at all. Stood at a Hatching and failed. Not to mention the fact that she fainted on the Sands. Much to her surprise, Impressed to Bronze Shainith, and has Monty as a mentor. The thought that her crush will be found out terrifies her. The Trailblazer Weyrlings are poisoned, though thankfully Shainith has only minor symptoms, but she's more afraid than ever of the possibility of losing him. A small bronze, literally. Shainith is small and lean, and that makes him fast. Seriously, what the shells, Shainith. He is remarkably durable too, even getting knocked around doesn't faze him. He walks with his head held high and there is something awkward about his gait that causes him to be incredibly light and fast on his feet. It is weird. 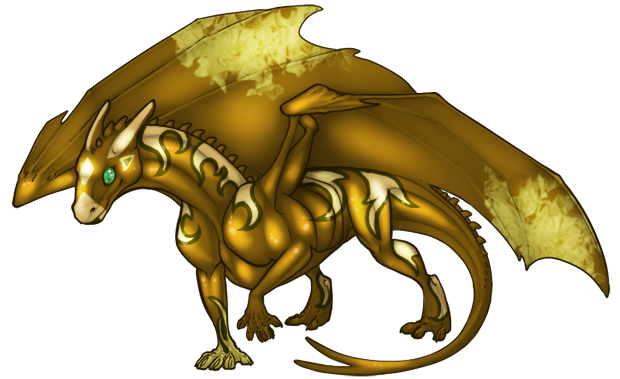 He is a pretty standard, shiny bronze all over, with his markings looking like pale, tarnished and goldeny fires licking over his face, his body, and his wingsails. There are large patches on his face, as if he is covered in diamonds. Shainith sounds like he is always ready to greet the day. Friendly and chipper boy with a good heart. Shainith is made of friend. He is big, lovable, and very sweet... but he also is loud and has very little concept of subtlety. He is very caring and incredibly empathetic. 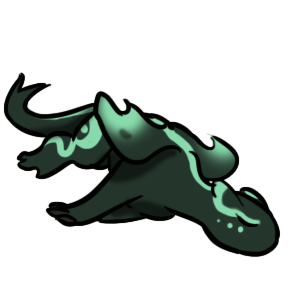 People who are upset around him distress him quite a bit to the point where he will make very distressed noises and you would think someone died. He gets sad at sad harper songs and thinks that sunrises and sunsets are the most beautiful thing that anyone has ever seen. It seems like he never gets tired, always going and going until suddenly he is asleep somewhere that he is hard to move. Maybe that will get better, who knows? To his rider, Shainith is still made of friend. He will tuck them into bed for as long as he can and try to run errands for them and do basically anything to make them smile. He will also push them to do things to better themselves and not take 'no' for an answer. He knows that sometimes you need to do things you don't like in order to be better, and that means you have to maybe get bumps and scrapes and cry a little. It's not always nice, but he tries to make sure that they will be better, along with himself. 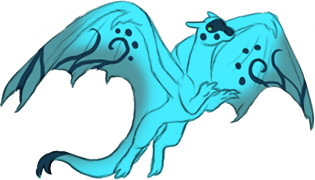 Robber is a bright little blue, with a hide of a color that suggest a bright sunny day, marked with darker navy swirls and spots on his wings and tail; his face bears a dark mask rather like that of a raccoon. He’s a dainty little thing, quite quiet when he wants to be, and more than capable of stealth. Robber is, true to his name, quite a little thief. He doesn’t mean to cause trouble, exactly, but when he sees something he wants that’s small enough for him to fly off with, he’ll take it. And what he wants is most things, especially if it’s shiny or looks like something his owner would like (though he isn’t interested in sharing with her; he just wants to have things she likes to himself). Other than his hoarder tendencies, he’s quite a sweetheart. He’s affectionate when he feels like it, though he’s been known to stroke people back when they pet him. He’s especially fond of playing with people’s hair. For some reason, he also seems to be more active at night, much to Tana’s dismay.